The concessions manager at a professional indoor soccer team's stadium needs to be able to predict attendance several days before home games (in order to make staffing decisions), and to refine those predictions on the morning of game day (when food must be defrosted and sent from off-site to the stadium). The quality of the incoming opponent (measured by that opponent's recent winning percentage), as well as the amount (in dollars) of advertising planned by the team's owners over the days leading up to a game, are known to him well in advance of game day. On the morning of game day, he can, of course, observe whether it's clear ("weather"=0) or raining ("weather"=1). The correlation between advertising and attendance is negative! The phenomenon is explained (without need to know the backstory) by considering the correlations between the explanatory variables: Apparently, the most advertising is being done against low-quality teams, and (from the regression) low-quality teams don't draw many fans to the stadium. Advertising helps (again, from the regression), but not enough to fully offset the low-quality-induced reduction in attendance. 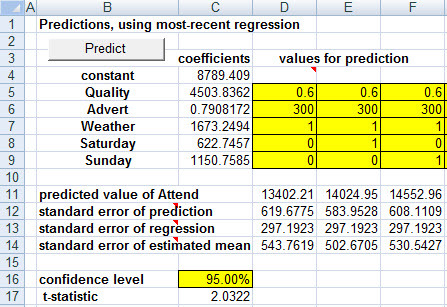 How might we bring game-day into the regression model? By selecting one of the three possibly game days as our "foundation" case, and creating two dummy variables which indicate whether a game is played on one of the two non-foundation days. As the predictions below show, the pure game-day-related difference between playing on a Friday, Saturday, or Sunday is that Saturdays draw 622.75 more attendees (on average) than do Fridays, given the same opponent quality, advertising, and weather. And Sundays outdraw Fridays by 1150.76 (and consequently outdraw Saturdays by 528.01. In the new regression, the coefficients of the dummy variables are rearranged, but ultimately convey precisely the same message as before. When we play this modeling trick, using a collection of dummy variables to represent one qualitative variable, one new issue arises: The significance levels of the individual dummy variables don't really tell us whether there's evidence (or not) supporting the inclusion of the qualitative variable (i.e., all of the dummy variables) in our model. If some of the individual significance levels are near 0, and others are large, what conclusion can we draw? 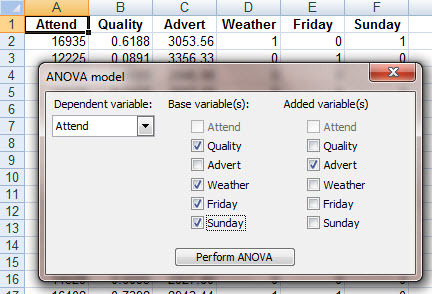 Fortunately, a technique known as "analysis of variance" (abbreviated ANOVA) answers this question. Imagine the variables in the model separated into two groups: the base group (of everything other than the dummy variables representing one qualitative variable), and the added group of dummy variables. Hypothesize that the true coefficients of all of the added variables are 0, i.e., there's nothing amongst them that belongs in the model. Then the significance level of the sample data, with respect to this null hypothesis, is found at the lower right-hand corner of the ANOVA table (cell G10 on the ANOVA tab in KStat). In the current case, that significance level is so close to zero that its first four decimal places are all 0, and we therefore conclude that the data overwhelmingly contradicts the null hypothesis, and supports the alternative statement that game day does belong in our model. i.e., precisely the same significance level of 0.0288(4)% that we did in the regression.